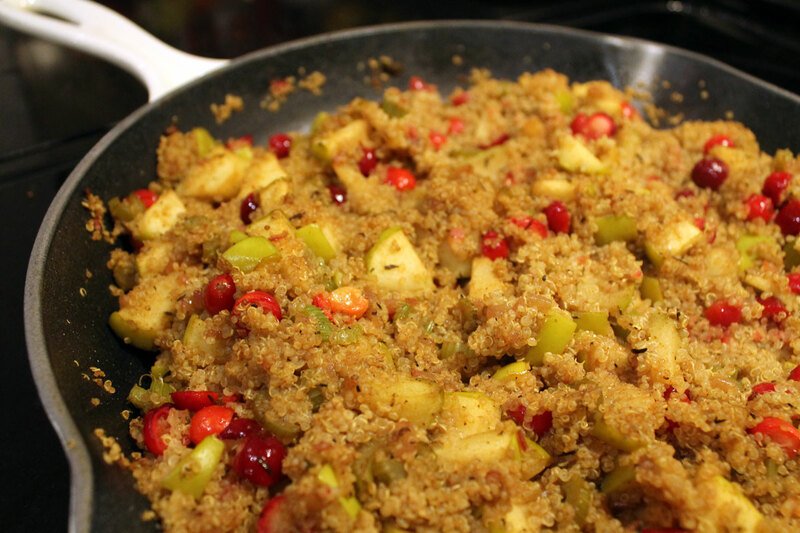 A new favorite at Thanksgiving this year was a gluten-free cornbread stuffing with cranberries and apples that came from the Gluten-Free Goddess (Thank you, Karina!). I thought the flavor combo was just too delicious to be reserved for only special occasions, so I tried making it a little simpler for something more weeknight appropriate and used quinoa instead of gluten-free cornbread. I use quinoa a lot (like here, here and here) because it’s such a versatile and incredibly good-for-you grain. Quinoa is like a lighter, finer rice. It’s ridiculously high in protein – and is actually the only grain that is a complete protein with all nine essential amino acids making it an excellent choice for vegetarians. It serves as the perfect base for pilafs and medleys, and works great as a side dish or tossed in a salad. 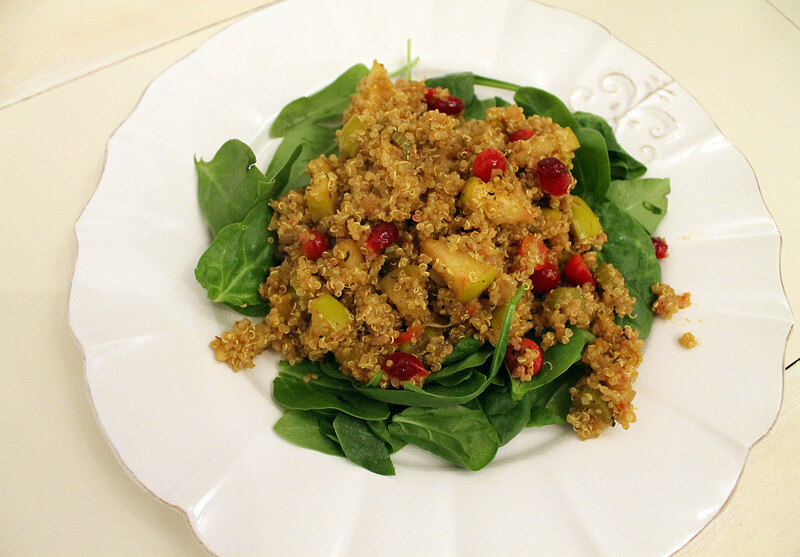 You could serve this cranberry apple quinoa mixture on the side of roasted chicken or have it, like I did, simply over a bed of spinach. The flavors scream holiday and the spice from the curry powder and cinnamon warm you up from the inside out. Why not make a regular old Monday night in just a little more festive? First, rinse the quinoa well and set aside. Bring 2 cups of water to a boil in a medium-sized pot and then add the quinoa and little salt. Reduce heat, cover and simmer 15 minutes or so, until all of the water is absorbed. Meanwhile, preheat oven to 325. In a cast iron skillet (you’ll be transferring it to the oven later. If you don’t have cast iron, any skillet will do, you’ll just need to put everything in a baking dish when it comes time to bake). heat 2 tbsp olive oil over medium heat. Add thyme, curry powder and cinnamon and stir to flavor the oil. 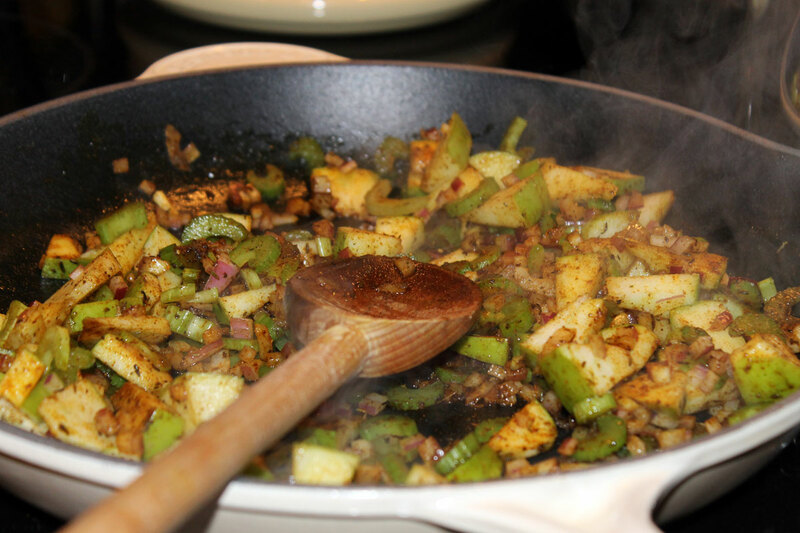 Add the onion, celery and apples and stir to coat everything evenly with oil. 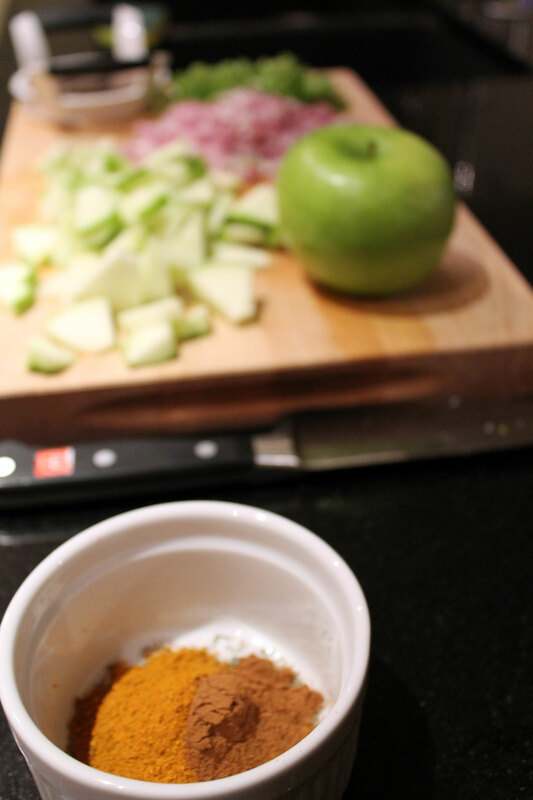 Continue cooking until the apples soften. 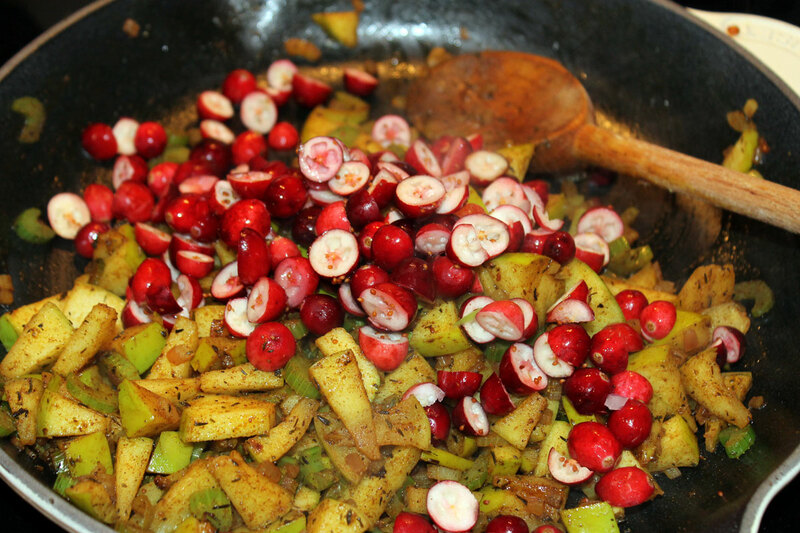 Remove skillet from heat and add cranberries. Mix in quinoa and stir until evenly combined. Stir in vegetable broth, maple syrup and salt and pepper to taste. Move the cast iron skillet to the oven (or transfer contents to a baking dish) and bake 20-25 minutes. Serve over fresh spinach for a lighter meal or along with herb roasted chicken as a seasonal side dish. Have leftovers? Throw it in with a mixed green salad for lunch. yum! This looks amazing, and so festive! I love the idea of using quinoa in stuffing! this looks delish! I am for sure going to change up my usual quinoa recipes and try this one! Since you won the contest at My New Roots, I decided to check out your website. 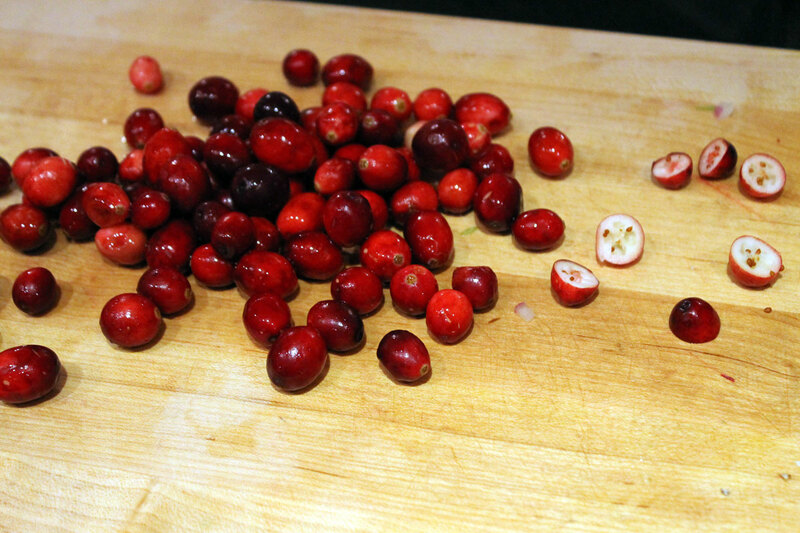 After spending all day cooking the food for Christmas Day, I came upon this recipe, since I had leftover cranberries from the pie it was perfect. It was so easy and a hit with the whole family!! Have yourself a very Merry Christmas! Hi Joanne – I am so happy to hear that you all enjoyed the tart! And the touch of chocolate sounds so delicious. Thank you for sharing. Hope you had a very merry Christmas.